When an idle transformer is re-energized, the transformer inrush current phenomenon occurs and causes various problems. The Inrush Limiter T1 suppresses the inrush current by controlling the phase angle at which the circuit breaker closes. Since it's market launch, the Inrush Limiter has been praised for its effectiveness in limiting inrush currents. It has been used for numerous transformers in electrical power receiving substations for electrical utility companies, power receiving facilities in factories, and substations for wind-power generation facilities. The inrush current phenomenon of a three-phase transformer is caused by mismatching polarities and absolute values of the initial magnetic flux induced by residual flux remnants in each phase core before the transformer is energized, and the system voltage immediately after the transformer is energized. This inrush current can be suppressed by limiting these mismatches. Technically, the key to suppressing the inrush phenomenon is in accurately assessing the polarity and absolute value of residual fluxes in each phase core when the transformer is disconnected by the circuit breaker. The value of residual flux that occurs when the transformer is disconnected is not the immediate magnetic flux that occurs when the circuit breaker is tripped. Residual flux is the final value of magnetic flux transients that occur immediately after disconnection. The Inrush Limiter integrates the transformer voltage (VT output voltage) by time to digitally calculate and capture the true residual flux. Specifically, it uses the transient waveform of the magnetic fluxes in the cores after the transformer is disconnected, and the value at which those fluxes converge. The next time the transformer is energized, phase angle control is applied to the timing of the circuit breaker to effectively suppress inrush current. 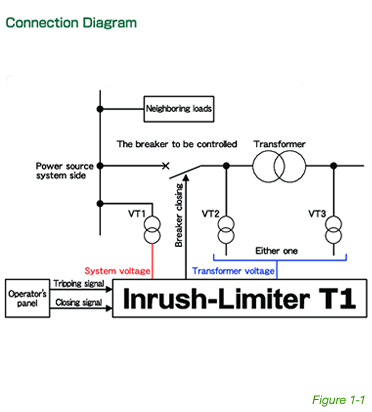 - The Inrush Limiter can be used with any transformer, and is not limited by capacity, voltages, connection style, impedance, or other transformer ratings. The type of circuit breaker and busbar design is also irrelevant. - The only required inputs are the three-phase VT voltage on the high voltage or low voltage side of the transformer, and the auxiliary switches of the circuit breaker. The only output is a time-delayed signal that operates at the optimum connection phase angle. The I/O interface is extremely simple and requires no tuning adjustment. - The core processing unit has a circuit board module with a digital processor that calculates, in real-time, the voltage waveform of each phase when the transformer is disconnected, and the magnetic flux waveform as the integral of the voltage input. This processor then calculates the optimum timing at which to connect the circuit breaker the next time the transformer is to be energized. 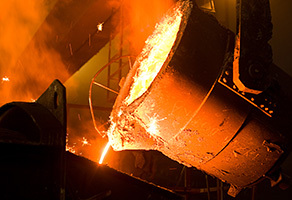 This allows continued performance without maintenance or regular inspections. The inrush current phenomenon is a transient phenomenon that occurs when an idle transformer is re-energized. The transient effect appears as huge unbalanced sharp-edged waveforms across the three-phases that are several times larger than the rated current, and 20% voltage drops that can last from a half to several seconds. This can cause various failures to the load side nearby the transformer in substations that are used for many different applications. Kodensya's Inrush Limiter effectively suppresses the inrush phenomenon that occurs when operating the circuit breaker for transformers used in various applications. The Inrush Limiter effectively prevents voltage drops for all loads served by special high voltage systems and power distribution systems. The Inrush Limiter prevents failures in power loads and their control systems where stable voltage and current is required. 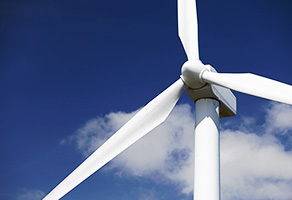 Distributed power generation systems (wind power, solar power, small hydraulic power) are usually connected to low power transmission and distribution lines (over long distances at high impedance) where voltage drops associated with the inrush phenomenon are a serious concern. 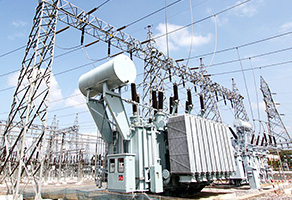 The Inrush Limiter plays an important role at these distribution substations.